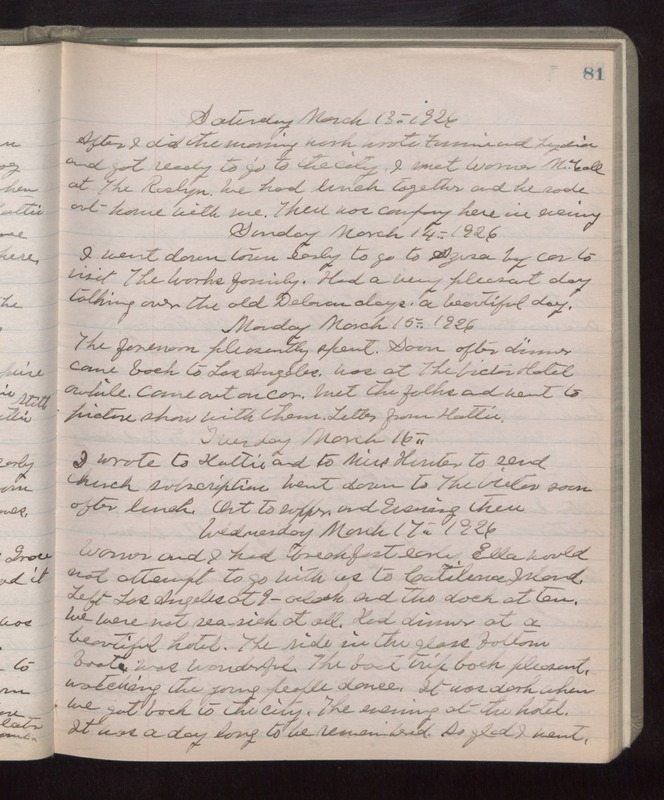 Saturday March 13th 1926 After I did the morning work wrote Fannie and Lydia and got ready to go to the city. I met Warner McCall at The Roslyn. We had lunch together and he rode out home with me. There was company here in evening. Sunday March 14th 1926 I went down town early to go to Azusa by car to visit The Works family. Had a very pleasant day talking over the old Delavan days. a beautiful day. Monday March 15th 1926 The forenoon pleasantly spent. Soon after dinner came back to Los Angeles. Was at The Victor Hotel awhile. Came out on car. Met the folks and went to picture show with them, Letter from Hattie. Tuesday March 16th 1926 I wrote to Hattie and to Miss Hunter to send church subscription. went down to The Victor soon after lunch. Out to supper and evening there. Wednesday March 17th 1926 Warner and I had breakfast early. Ella would not attempt to go with us to Catalina Island. Left Los Angeles at 9 oclock and the dock at ten. We were not sea-sick at all. Had dinner at a beautiful hotel. The ride in the glass bottom boat was wonderful. The boat trip back pleasant watching the young people dance. It was dark when we got back to the city. The evening at the hotel. It was a day long to be remembered. So glad I went.